SNAP Cats rescued Bertha from Berkeley, CA. 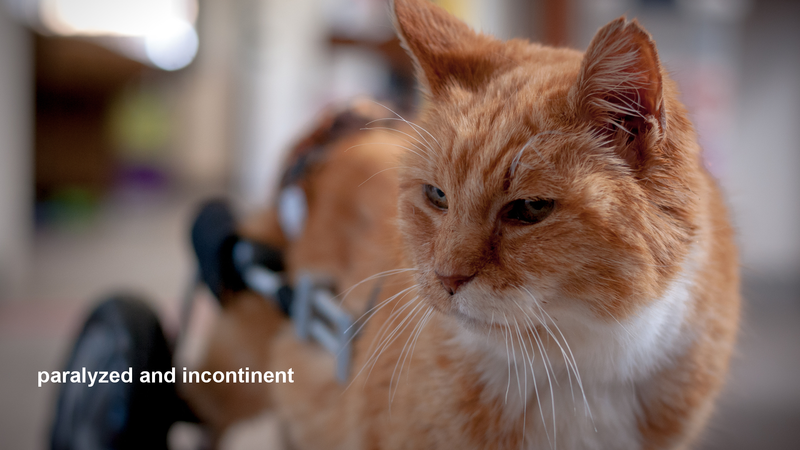 Bertha is the poster child for why you don’t let you cats outside – she was hit by a car and is now paralyzed. But that doesn’t keep Bertha from getting what she wants, whether it’s a wet food treat or a snuggle in your lap (Bertha LOVES to sit in your lap!). Bertha wears her SNAP Wraps dipes without objection, and needs to be changed twice a day to keep dry (she’s PU/PD – look it up). She’s easy to express, which cuts down on wet dipes and poopy pants. Bertha likes to be in her cart about 3-4 hours a day. It’s good for her back and keeps her muscles moving. Since Bertha will need her cart, her adoption donation starts at $600. A lot, we know, but we only buy the best carts, and that includes a set of SNAP Wrap dipes, so that’s the reason for this starting point. Although Bertha is considered a high-maintenance kitty, she’s really easy to maintain as long as you stay on a regular schedule of expressing and dipe changes. We should also note that Bertha is in the very beginning of renal failure, so a special prescription diet is recommended/needed. Please come and visit Bertha. You’ll fall in love with her as every one of our volunteers has! Thanks.